It’s been too long since I saw theatre at the Carleton Tavern. Too long I say! In my natural anticipation I arrived about an hour and a half early to begin supping on beer and wings, to prepare for the long night ahead. And oh, it was indeed a long night, in the best sense. The only company in town with the stones to host theatrical productions at one of the last remaining true dive bars in this town is, of course, Chamber Theatre Hintonburg, who last graced the space with their killer interpretation of Tremblay’s MARCEL PURSUED BY THE HOUNDS. Tonight, tho…tonight was to be all about Mamet. 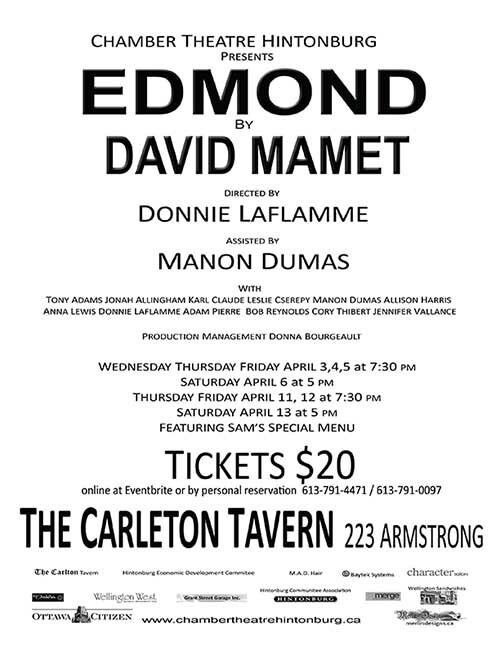 This particular slice of David M. was EDMOND, an especially controversial and contentious throat-punch of a play set in late 70’s New York, and centering on the titular Edmond (Donnie LaFlamme, Chamber Theatre head honcho and co-Director of the play with Manon Dumas). After a rendezvous with a fortune teller, Edmond decides to up and leave his wife one uneventful day, venturing out into the mean streets of NYC to find himself. Along the way he meets barflies, pimps, whores, hustlers, crooks, cops, charlatans, and the surprising depths of his own soul. It’s one of the most brash and intimate plays you’ll ever come across, and I have trouble imagining a better point in time and space for it to happen than here in Mechanicsville with Chamber, at the Carleton. 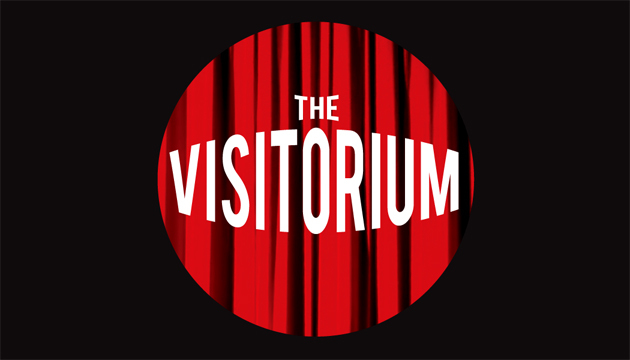 Because, and this is the honest God-Damn truth, when the Chamber Theatre gang put shows on at the Tavern, something very special happens, a kinda magic. And a more brutally honest, grimy, punch-drunk magic you’ll never find than with this production of EDMOND. Set on a makeshift stage midway through the main room at the Carleton, and aided by some killer bee sound design from Leslie Cserepy (who also co-stars), the story follows Donnie Laflamme as Edmond, on his poorly thought-out journey through the increasingly dark underbelly of the big city. Some stunning and inspired direction from himself and Dumas, who appears as his estranged wife, gives Mamets unflinching script a brilliant push as the harrowing tale is told. The ensemble cast is spot-on, many in multiple roles and making the occasional flamboyant entrance. Bob Reynolds, who impressed me way back in MECHANICSVILLE MONOLOGUES II, has great moments as a convivial bar patron and a menacing detective both. Anna Lewis and Jen Vallance shine as various ladies of the evening, endlessly haggling with Edmond over price. Allison Harris, in the crucial role of Glenna the waitress, is fantastic, likewise Adam Pierre as a fast-talking pimp. Leslie Cserepy, continuing his tradition of playing men of the cloth onstage, does great work both as a street preacher and a cardsharp, and my boys Cory Thibert and Jonah Allingham are great as always, especially in a key scene at a pawn shop. And I can’t say too much about Karl Claude lest I spoil the plot, but..wow. Want to see more. As for Donnie himself, omnipresent in every scene, is just perfect as schlub Edmond, desperately seeking a freedom he has no idea what to do with.